JOIN US SATURDAY, OCTOBER 14th–IN ESCONDIDO! During this event, we will have the opportunity to serve and love on the City of Escondido with the tangible example of the Gospel by providing free haircuts, bike repairs, health and vision screenings, grocery giveaways, makeovers, connections to community resources and more. Each event concludes with a message of Christ’s love and an invitation to accept Him as Lord and Savior. We are excited to have you join us in our efforts to continue Winning Our World. 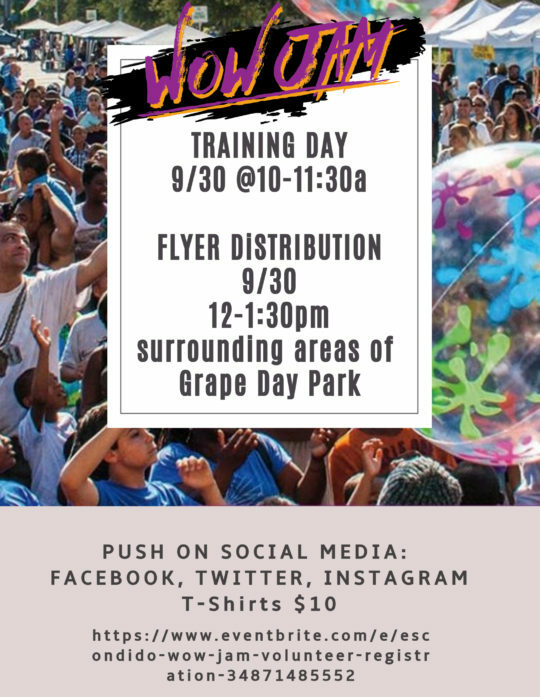 We request that everyone who signs up for the WOW JAM be available for all training dates, flyer distribution, and follow-up. This will be a combination of training at 10AM, Flyer distribution at 12PM.